When I was a little, I often said, “I wish I were older”, “I wish I could do this and do that”, “ I wish I could be someone who could achieve a certain level of success” and my favorite, “I wish I would wake up tomorrow and things around me would change so I would be appreciated by people around me.” I spent a lot time daydreaming and wishing things would happen. So, what’s my point? My point is that sometimes we can’t take what is going on around us, but we just wish it would go away. You wish it would change, but you’re not doing anything to change your situation. We can’t keep on wishing; sometimes we need to do something to change our situation. As I reminiscence on the past, I realized that what we do today will be the foundation of our future. In a way Someday is today; what you do today will help you achieve your goal. Just like doctors, they were not born doctors. They were babies that grew up and went to school like everyone else. They were once a kindergarten student like everyone else. They graduated middle school, high school, went to college, and eventually the journey led them to medical school. In the end, with all their hard work they became doctors. The same is true for many professions in life. To achieve something we need to do something. To gain something we need to earn it. As a basketball coach, I always tell my players that to get better as players we need to work on the fundamentals and practice. Practice does not make perfect, but rather we improve. In life, it is not worth striving for perfection. Our goal is to be better than we were a year ago. Each year we should learn something new. The day we stop learning is the day we will decay and be left behind. Write down your wish. By writing down your wish, it becomes a physical thing that you can see. List the things you need to do to achieve your dream. Let your inner circle know of your plan. This will up the game as everyone knows about it. 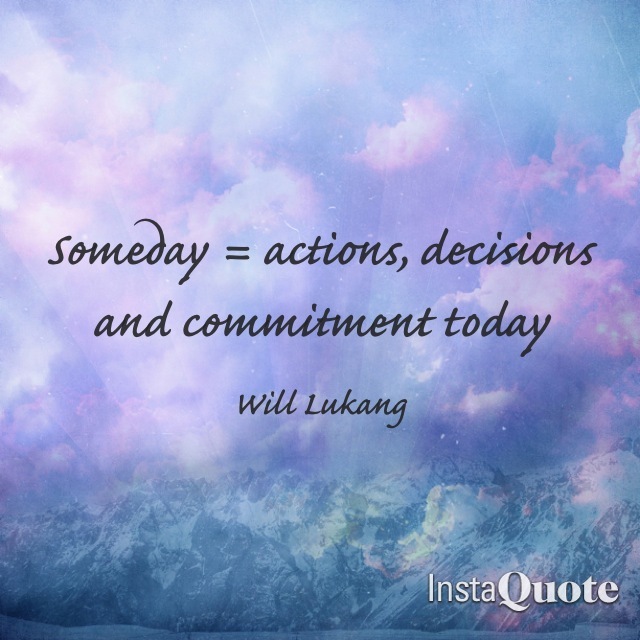 Remember that someday is today, the actions or decisions you made today will help shape tomorrow. If you want to achieve something someday, you must act today. Good luck!